The trout have begun their annual move to shallower waters. I recently went out with coworkers Randy and Josh along with Josh's dad Terry for some trout action on some of the many shallow grass flats off of Homosassa, FL. The best method for catching these trout was a D.O.A. Oval Clacker cork rigged up with 2-3 feet of 20 lb Berkley Vanish fluorocarbon leader material. On the business end of this rig, we have been doing very well with the D.O.A. 3" shrimp in New Penny and Rootbeer/Gold Glitter. I like using these shrimp because of the delicate way they fall in the water. The weights inside the shrimp are lighter than using a normal jighead so they have a slower fall. This requires anglers to work them a little slower than normal, but I find this can produce some of the biggest trout around. Plus, the shrimp are so life-like the fish can't resist them. I took out some Tennessee folk today! Josh, Corrina, Danny, Tiffany, and 3 year old Talon decided to do a combo trip of Fishing and Scalloping on the beautiful flats of Crystal River, FL. We decided to start the day off fishing for Redfish. I was getting a little worried because nothing much was happening at our first stop. We caught a Black Drum, some Mangrove Snapper, about a million Pufferfish, but no Redfish. We moved a couple times trying to get into the schools of fish that had been cruising the area, but it wasn't until the third spot that things heated up. I directed Josh to cast right where the drop off occurred off the side of a rocky point. 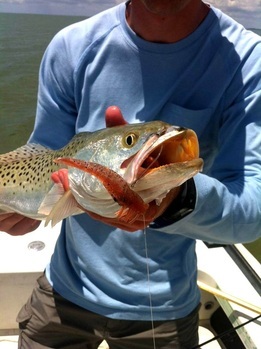 It was as if he had thrown directly into the 26" Redfish's mouth. As fast as he could land that fish, take pictures, and throw back out, he had another fish on that would measure about the same. We had found our school. 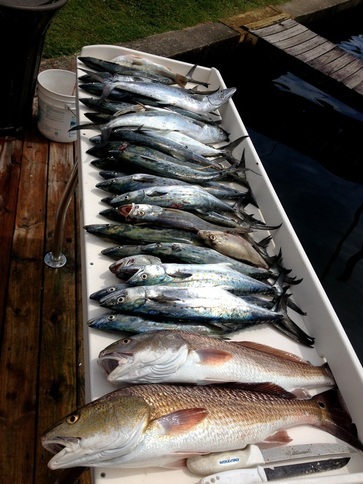 We landed a couple more Reds along with two Pompano, and some Black Drum. We moved to another spot and caught a couple more Reds and some Snapper. We brought 4 upper-slot Redfish, 2 Black Drum, 4 Mangrove Snapper, and a Pompano back to the dock. Needless to say the combo trip became an all fishing trip! Chuck decided he enjoyed fishing with me so much, he wanted to bring his two boys out to experience it. 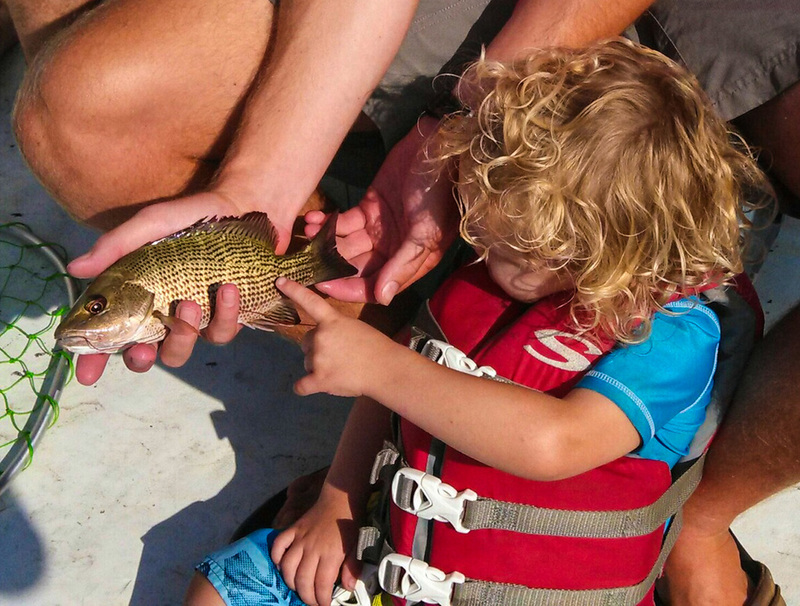 I always enjoy fishing with children due to their excitement and optimism. It's something that takes me back to when I was first learning to fish, and it didn't matter what I caught, but just that I caught something! 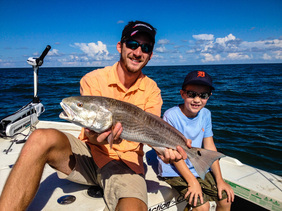 Regardless, we had a great day on the water, and his oldest son landed this nice Redfish all by himself which is a feat many grown men cannot attest to! 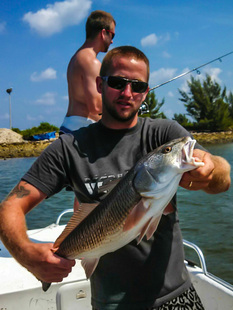 This chunky Red was caught on cut ladyfish rigged on a 5/0 circle hook. I like using circle hooks because they definitely reduce the number of fish that are gut hooked. They also make catching fish much easier for novice fishermen and fisherwomen because they eliminate the need for a sharp hookset and instead require a constant pull/tightening of the line to slide the hook into the corner of the fish's mouth. Many people I talk with don't like them because they have accidentally set the hook instead of just pulling gradually and that caused them to lose the fish. If you can remember to just let the fish hook itself, the hookup ratio is actually quite good! I had a great recent trip with Rick, Randy, and Chuck. We caught about a dozen Redfish, 3 Black Drum, 2 Sheepshead, 20-30 Mangrove Snapper, and 4 Flounder. It was constant fish all day and everyone had a great time. All of the fish were caught on live shrimp on the bottom. It's fun this time of year the great variety that you can end up with at the end of the day! 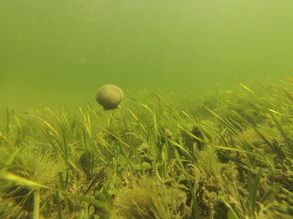 It was nice to get back out fishing because I have been doing a lot of scalloping lately. Families have been having great days on the water collecting the tasty shellfish. We haven't had any problems getting as many scallops as they could handle. 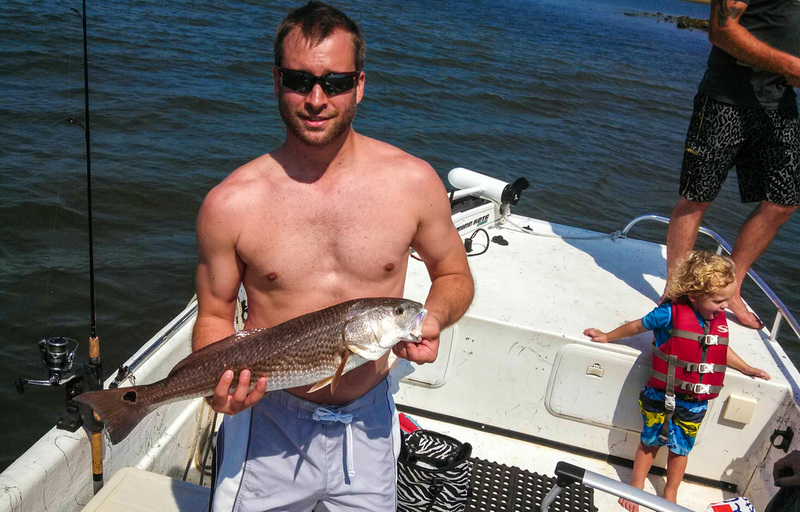 Redfish are heating up the flats right now. Look in the back country areas around oyster bars to find these hard fighting fish. Be very careful to not get stuck back in these areas on an outgoing tide because you might be waiting for the tide to come back in until you can float out. 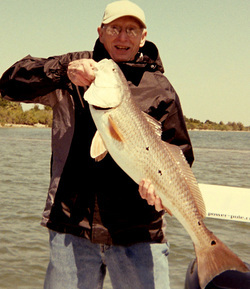 Whenever I go out redfishing, I usually have at least one 1/4 oz gold spoon, one soft white jerkbait, and a "Redfish Magic" rigged on 20 lb flourocarbon and 10-15 lb test Power Pro braided line. Flourocarbon is important when fishing in Crystal River because the water is so very clear that the fish can be picky and it is virtually invisible underwater. Braided line helps to increase casting distance, hook set power, and sensitivity when fishing. I highly recommend it. 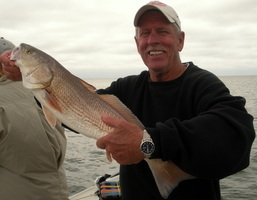 Something new I have found to catch Reds is the "Redfish Magic". I replace the soft plastic that come standard on the bait with a C.A.L. 3" Shad Tail by D.O.A. I've done well with the Motor Oil Red Fleck color along with New Penny and Rootbeer/Gold Glitter. The D.O.A. shad tail is much more durable than the other and I have had great success with it catching Redfish and even Flounder on a recent trip. Make sure to give it a try. Kyle Farmer with his first Red. 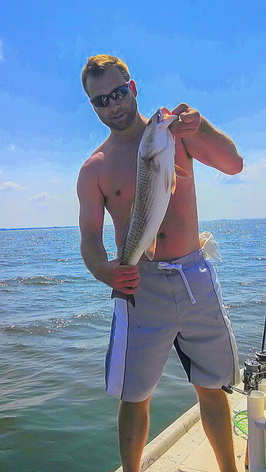 Caught with a Redfish Magic/C.A.L. Shad Tail combo. Scallops are on the flats in huge numbers right now. There were a ton a boats on the water for July 4th weekend, but they don't seem to have even made a dent in the scallops. Usually for my scallop trips we leave at either 8 or 9 a.m. and come back to the dock between 1 and 2 p.m. Possibly sooner if we get our limit of 10 gallons for the boat. We haven't had any problems getting our limit over the past two weeks. 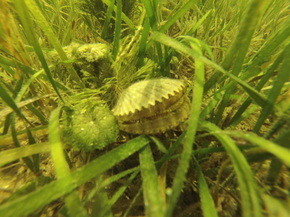 If you've never tried scalloping, I encourage you to give it a shot! It's a great family activity and perfect for those hot summer days. As you can see, it's been a successful tarpon season! Tropical Storm Andrea threw things into a bit of a tailspin for a week, but it didn't take long for the tarpon to start flooding back in again. We had our greatest success casting D.O.A. Deep Runner Baitbusters in chartreuse, red/white, and black/white. 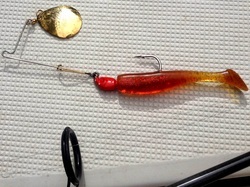 It was not uncommon for us to hook several tarpon a day using these swimbaits. They are effective enough that you can even blind cast them while drifting through areas known to hold tarpon. That cannot be said for many other baits... Since we have always used D.O.A. baitbusters, I decided to try other companies' products to ensure that I was giving my clients the best possible lure to throw. The difference honestly surprised me. I knew that these were good all around baits, but D.O.A. completely outfished the others. If you can make the cast to get one in front of a tarpon, he's going to eat it. It's as simple as that. When I took a break from the tarpon, I've found trout in fairly deep water (7-12 feet). 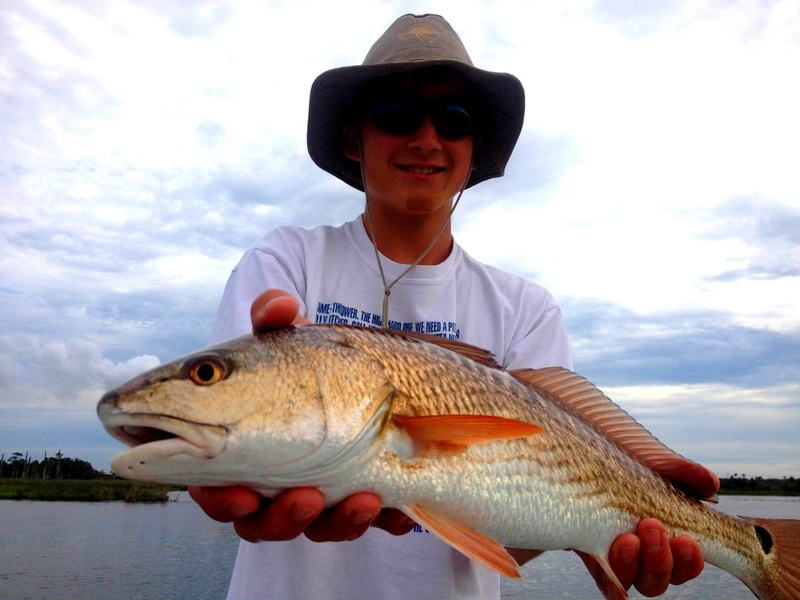 Redfish will be around quicker moving, shallow water because it will be cooler. The closer we get to fall, the better the redfishing will get. Huge Black Drum can be caught on the flats right now. Look for Shallow water rocks and fish with a quarter or half of a crab or a shrimp. The trout have been biting well over the past week. 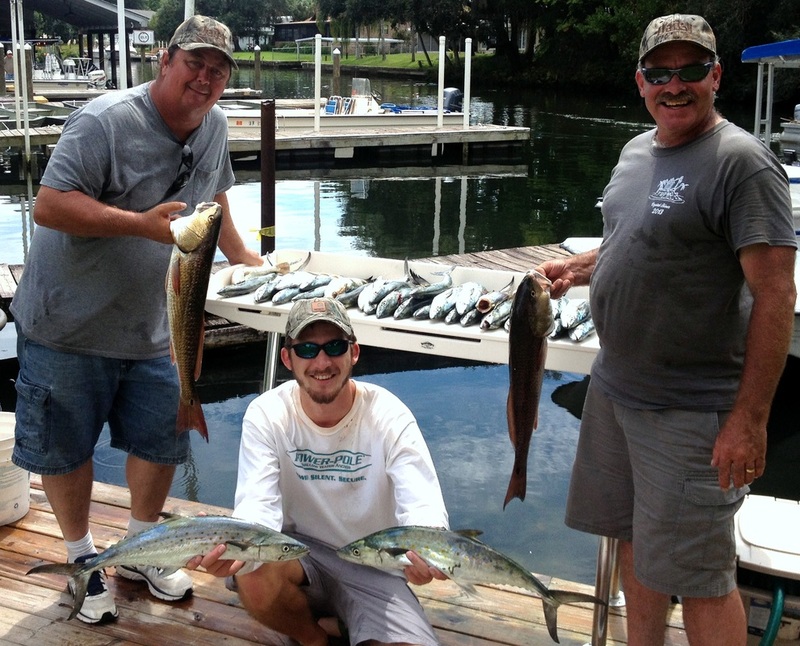 Anglers have consistently caught fish over 17 inches. While trout fishing, we have been catching good numbers of Black Sea Bass which are a delectable fish similar to grouper. The best producing bait has been the D.O.A. 3 inch shrimp in the New Penny color. This can either be rigged with the normal insertable weight under a popping cork, or on a 1/16 oz. jighead in deeper water. Target depth ranges of 3-5 feet for bigger trout and 7-10 feet for greater numbers and Sea Bass. 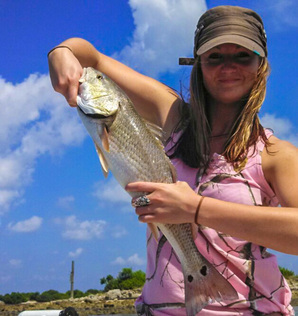 In deeper water, you may try drifting with the jig dragging behind the boat as opposed to casting constantly. This will keep your bait in the strike zone longer and you can easily feel the bites. Raise and lower your rod to give the shrimp a jump and fall. Redfish have been schooling in very shallow water (less than 3 feet). 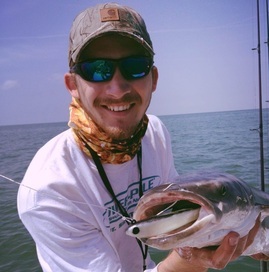 Anglers can sight cast to these fish with a 2" or 3" DOA shrimp in a natural color, live shrimp or crab, a white jerkbait, a gold spoon, or a DOA softshell crab. These spot tails also love a spoon fly or a crab fly. You can also target deeper oyster bars with similar baits where sight fishing is too difficult. 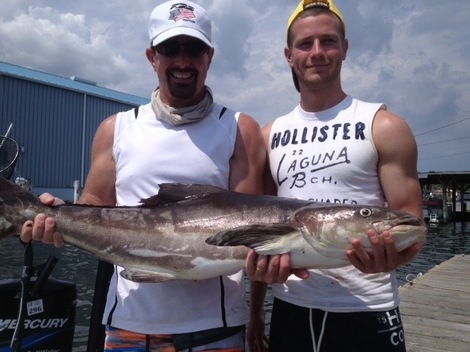 There have been trophy Cobia cruising the flats over the past month. At first glance, these may appear to be a shark due to their pronounced pectoral fins and streamlined shape. 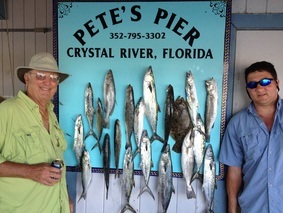 However, at closer inspection, you will find one of the best eating gamefish in the Gulf waters. The best way to target these fish is to keep your eye out for a large dark fish swimming just under the surface. Cobia also congregate around channel markers, crab traps, and Sting Rays. They will hide underneath the rays waiting to ambush a school of baitfish. It never hurts to flip a cast to one of these spots in hopes of hooking up. I find that one of the best baits to use for this purpose is the D.O.A. Baitbuster. The subtle vibrating action of the swimming tail design allows the fish to track it down even once it is out of their range of vision, and right in front of their mouth. Other baits lacking this action will lose the fish's interest once they lose sight of it. John and Taylor Gwaltney were lucky enough to hook up with this monster on a recent trip. As if that wouldn't be enough of a fight, John did it on 12 lb test monofilament! After about 45 minutes of drag screaming, we were able to wrangle the beast into the boat. The Trout bite has been fantastic lately! Not only have anglers been catching trout, but they have been catching big Trout. I fished with Rod and Tom today and they whacked the Trout and Mackerel. Due to the recent cold front, the bite was slow and tough to detect. We were able to catch these picky fish by crawling jigs over the grass/sand flats. The bites felt like a dinks but once you set the hook, it wasn't uncommon to find a 20+ inch Trout on the line! 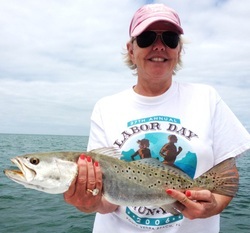 Once we had caught Trout for a few hours, we moved to Spanish Mackerel territory. Tom quickly caught a nice flounder to start us off and Rod was close behind with a 30 inch Mack. We caught Mackerel for the next few hours, only keeping the biggest of them. 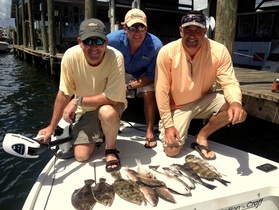 We also sight fished to Tripletail, Cobia, and Sharks. One of these Sharks was an 8 foot Tiger that came out of nowhere to inhale a small silver Trout that was on Tom's line. He came off but not after munching most of the small Trout. To finish the day off we moved in shallow for some Mangrove Snapper and Redfish. They left with two big bags of fish for a neighborhood feast. The ever so knowledgeable weather forecasters sure messed up today. After calling for 15 knot winds all week, we were quite surprised to find there was hardly a puff of breeze in the morning. We started off going shallow to the backcountry in search of Reds. 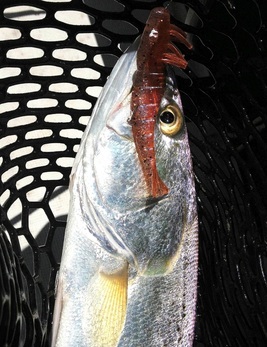 It wasn't long before drags were screaming and we boated several along with some mangrove snapper. We left there to try the trout bite in deeper water (about 6 feet). It was a little slow but the ones we did catch were whoppers. Since the wind was still slack we went off to even deeper water (about 10 feet) to try our hand with the Spanish Macks. They were hitting hard and aggressive as always, along with some Blacktip Sharks, Bluefish, more Trout, and Ladyfish. The wind finally started to pick up as we were heading in, but before we called it a day, we did a little sight casting to Tripletail. Today's tip: make sure to check the weather extensively before hitting the water. Even though this may be a bad example because it wasn't exactly as they said, it helps to have an idea of what to expect when you're out there. You can even download apps on your smart phone that can access radar from on the boat, which I have found particularly useful! 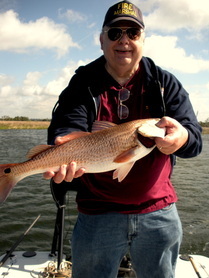 Henry with his nice slot-sized Red. Wind was still blowing today, but that didn't stop Henry, Ed, and Dan from going out anyway! Started off the day with some nice mackerel, and a tripletail, but once the wind picked up harder, we moved to the backcountry where we caught Mangrove Snapper and Redfish. This beauty was one of the Reds and also Henry's 2nd ever (it shortly followed his first ever haha). Surprisingly enough, the first Redfish he caught ended up being his third as well. The hungry fish bit again a couple hours later when we returned on a different tide! We had a great time and I look forward to fishing with these gentlemen again. Had a great day today with Amory Planchard who was visiting from Tennessee. Wind was howling but we were able to hide in the backcountry and Amory pulled off an inshore slam (Redfish, Trout, and Snook). We boated over a dozen Reds and had a great time doing it. As soon as the shrimp hit the water, the drag would start screaming out! I could barely keep his hook baited! We caught most of our fish on live shrimp but caught some on 1/4 ounce gold spoons and soft plastics. Nothing beats seeing a big redfish "breaking his neck" to eat a topwater. Since they are naturally bottom feeders, only the hungriest of fish will attack a topwater bait, and most of their head must come out of the water in order to engulf the bait. The Macks are in! The Macks are in! We have been cashing in on these aggressive, hard-hitting fish for the last couple of weeks now and I expect them to stay for the remainder of the year. It's always a joy whenever they come into the area because it means great action that people from all ages can enjoy. 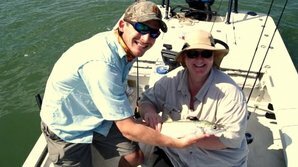 Your best bet when fishing for Spanish Mackerel is to find some sort of bottom structure that is different from the surroundings. It should be in 7-12 feet of water, and if you find a trough, ridge, rock pile, or point, there will probably be fish congregating there. You will want to bring a chum bag with you and plenty of live shrimp. Also, don't forget to bring some wire along as these fish have some of the sharpest teeth you will find anywhere. Rig a shrimp under 3-4 feet of line/wire leader or freeline a shrimp in the tide. Oh, and don't forget to hang on! I had the opportunity to fish with some real Canadian's today! It was a very cool experience showing Dave, Shannon, and Mason all that our beautiful state (and country!) has to offer. Though the weather professionals had been back and forth on the forecast, the day turned out to be amazing with a light breeze and plenty of sunshine. The trout were cooperating as well and the action was nonstop all day long. We even caught a flounder, multiple lady fish, and a blue crab. Most of our fish came on 1/4 oz. jigs drifting through 3-5 feet of water. Just hop the jigs above the grass and wait for one to engulf it. As you drift, don't get discouraged if you aren't catching anything for 5-10 minutes. They seemed to come in waves and we would go from a period of slow activity to all four of us hooked up at once! We ended the day with nine keeper trout for their fish fry, plenty of memories, and a good ole Florida sunburn. Pictures soon to come. It must be Springtime! The Seatrout action has been fantastic lately and I expect it to stay that way for the next couple of months. Rick Lawrence and Helene Lawrence went with me today along with their daughter Suzanne Brown. They were able to bring a couple nice trout home for dinner. 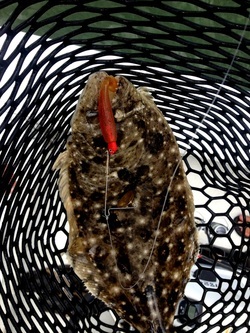 Anglers have been cashing in on this bite using flukes and jigs in and around oyster bars. Look for an area with a good mix of bars and grass flats. This gives the trout a place to live and also to ambush. You can also rig up a popping cork such as a Cajun Thunder with 2-3 feet of 17 lb fluorocarbon leader and a jig underneath. This is an especially good method to try if you aren't very keen on feeling the bite yet because you can watch your cork. Now a quick lesson about these popping corks: first, you'll want to cast them out away from the boat (farther than 50 feet if possible), second, work the cork back to the boat with a series of quick and sharp pops, third, don't be afraid to let it sit for a little bit (10-15 seconds) especially if the bite is slow that day. You can play around with this to figure out what the fish want on that specific day. Sometimes, it can be good to pop the cork loudly several times before letting it settle for several seconds. Make sure you are making plenty of noise with the pops or else you won't be as successful. A quick note about the action out of Crystal River. Sheepshead have been hitting well. Find a rock pile in 6-12 feet of water and fish around it with a live shrimp. Use a fairly heavy weight to make sure it gets down deep enough. This should produce Sheepshead along with grouper and snapper. 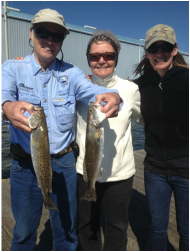 The trout are also enjoying this warm weather as we prepare for the springtime trout season. Spanish Macks can be caught with a chum bag and free-lined shrimp after a few warm days like this.